Clarkson told the Sun, for whom he writes a regular column, that an unnamed BBC executive had "asked if I'd come back to Top Gear" last week. 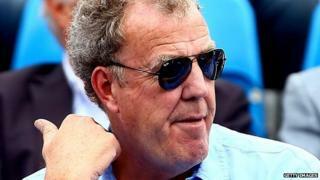 But Clarkson said he refused: "It would have been impossible to make the show I'd want to make," he said. The BBC has named Chris Evans as the new host. "We haven't offered another Top Gear contract," a spokesman said. "The BBC had placed on record its thanks to Jeremy for his broadcasting on the programme and wish him well for the future." Clarkson, who was sacked for punching a Top Gear producer in March, told the Sun that returning to the Top Gear role "was never an option". "Too much has gone on. After I'd been compared to Jimmy Savile by someone from the BBC and it was splashed all over a Sunday newspaper, how could I go back?" he said. "The spotlight would have been on me and the show would end up being neutered. It would be difficult to do anything without interference." The 55-year-old presenter has also revealed plans for a new motoring show to rival Top Gear, which is set to return to BBC screens next April. It is anticipated that Clarkson's former co-hosts, James May and Richard Hammond - who decided against returning to the BBC without him - will also join the new venture. Meanwhile, The One Show has confirmed Chris Evans is to leave the BBC One programme. On its Facebook page, an entry posted read: "Breaking News! Chris Evans is leaving The One Show!" His replacement for the Friday evening show is yet to be announced. Evans launched a search for new Top Gear presenters on Friday. An open audition invites fans to post a short video to the BBC. It should be no longer than 30 seconds, and must not feature cars, stunts or gimmicks - just the applicant talking directly to the camera. Evans said the hosts could be "male, female, young or old, it doesn't matter". However, he clarified, the job on offer was not necessarily that of presenter. "You could be auditioning to be a driver. You could be auditioning to be a film reporter. Or you could be auditioning to be a co-host. "If we don't find anybody who's good enough, if there's nobody right for this from these videos, we will not be appointing anyone. Or the whole new team might be from these videos. We don't know." Evans added that the age limit had been raised to 17. "Yesterday I said 16, sorry about that." Submissions can be made through the Top Gear website: bbc.co.uk/topgear. The deadline is 20 July.